Brighton midfielder Alan Navarro hopes to be fit enough to earn a place in the Albion first team by the end of March. The 29-year-old has been on the sidelines since sustaining a cruciate knee ligament injury in August. 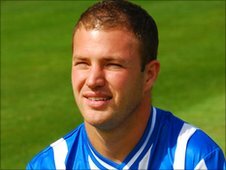 He told BBC Sussex: "My knee's getting stronger so I'm getting used to being involved in tackles in training. "Even now I'm still two to three weeks away from being involved in the first team. I'm going to push whoever is in my position all the way." The former MK Dons man returned to action on Tuesday, playing 45 minutes in a behind-closed-doors friendly against Tottenham Hotspur. "It was a long time coming," Navarro continued. "I enjoyed it and it was great to be out there and being involved." In Navarro's absence, Brighton have opened up a four-point lead at the top of League One and hold two games in hand over second-placed Bournemouth. "The lads have had good success on the pitch and I want to be part of it," he said. "I want to be back where I was but it's going to be difficult. "I just want to be pushing for a place in the squad more than anything, and see how it goes." Manager Gus Poyet added: "Navs has done a terrific but difficult job, spending hours on his own working with the fitness coach and physiotherapist in the gym and in the pool. "I'm pleased for him because everyone knows he's a player I like because he understands football in a way I really like. "I'm looking forward to see if we can start using him slowly."